Ancient incised cross at the Monastery on Skellig Michael. The Irish Jesuits were among the first to realize the potential of the Internet for prayerful reflection. The result was the global phenomenon which is "Sacred Space" - guiding six million visitors each year through a self-paced session of prayer centred on the daily Gospel readings of the liturgy. 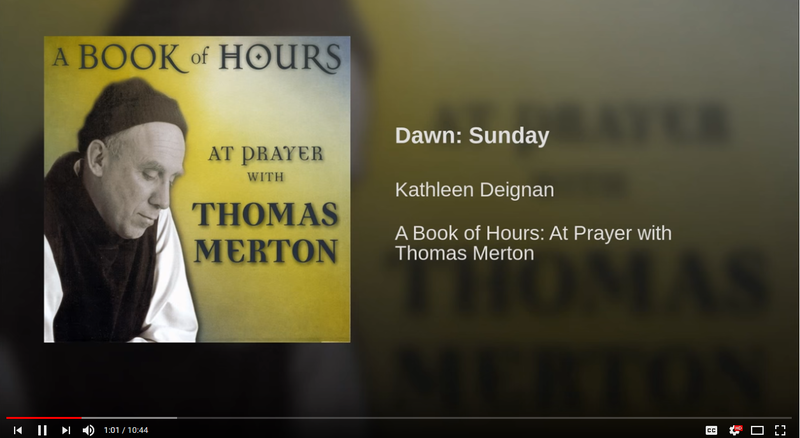 “At Prayer with Thomas Merton” presents daily prayers for dawn and dusk, drawn from the writings of the great 20th century Trappist mystic, Thomas Merton, interwoven with excerpts set to music composed by the sacred music composer (and president of the International Thomas Merton Society), Kathleen Deignan, C.N.D. It is a beautiful resource for a contemplative start and finish to each day of the week. "The Morning Meditation" is a daily devotional podcast from the church of Shady Grove Baptist Church in Boissier City, Louisiana. Living Space is the area of the renowned Sacred Space website where you will find enlightening and thought-provoking commentaries on the daily scripture readings. 3-Minute Retreats from Loyola Press invite you to take a short daily prayer break right at your computer. Spend some quiet time reflecting on a Scripture passage. Church Services TV is a website where you can access live streaming of Catholic Church services in Ireland and the UK.While the services currently being streamed are Catholic, the site is actively recruiting those of other Christan denominations. A very useful feature is "What's on now". Two very short Morning Prayer videos on YouTube, with music and reflection. See here and here. A regular cycle of daily prayers – the ‘Daily Office’ – is at the core of the life of the ecumenical Northumbria Community, a dispersed Christian community with strong links to the saints and scholars of Ireland, the wisdom tradition of the Desert Fathers, and the ‘mixed life’ of the Franciscans. Access the daily prayers on this website. Daily Prayer is a volunteer publication of Daily Prayer Ministries, Inc., a nondenominational ministry dedicated to the glory of Christ. Daily Prayer from the Church of Ireland - texts of the service for each day. There is also a recently-launched app for daily worship for use on a mobile device - search App Store for "Chiurch of Ireland". "Surely each day is calling us to a beautiful task, a mission designed particularly for us. The art of moving through the day waking up to our call is a sacramental journey....a pilgrimage". Inspiring morning prayer and reflection from Macrina Wiederkehr, OSB. The World Community for Christian Meditation, inclusive of all denominations, shares a commitment to the discipline of meditation inspired by the early Christian Desert Fathers and Mothers, as taught by an Irish Benedictine monk, Fr John Main, OSB (1926-1982). Today, his successor, Fr. Laurence Freeman OSB, continues the teaching of this ancient and simple twice-daily contemplative practice. Click here to find out more. For nearly three thousand years, men and women from diverse lands and cultures have been lifting their hearts to God by praying and singing the psalms. The Psalms: 150 Ways of Praying is an online course from the English Jesuits. It explores why these beautiful and timeless songs have such universal appeal and shows how the psalms can set us on a pathway to deeper prayer. The Liturgy of the Hours﻿ (also known as the Divine Office) is the richest single prayer resource of the Church. The practice of sanctifying the 24 hours of the day with psalms, hymns, readings and other prayers during "canonical hours" (periods of fixed prayer at regular intervals) is of great antiquity. Universalis is a clear and user friendly website, which makes the Divine Office very accessible on desktops and mobile devices. This means the Office can be prayed anywhere, whenever there is a space, however small, in life's hectic round of activities. The London Internet Church, based in the Anglican church of St Stephen Walbrook - one of Sir Christopher Wren's masterpieces - is a gathered Christian global community that meets online to worship, enquire, encourage and pray. Beautiful online services of quietness and reflection, and a daily changing morning and night prayer. An international work of Saint Louis University, the﻿ Sunday Website﻿ has had one and a half million page views in the last 16 months. It prepares site visitors for Sunday Mass by supplying the coming Sunday’s readings, prayers for contemplation on these readings, aspects of spirituality found in them, background information on them and the Sunday, and finally, musical pieces being played by selected parishes in North America and England. Pray As You Go is a daily audio guided prayer session, designed to help you pray whenever you find time, but particularly whilst travelling to and from work, study, etc. For mobile devices, simply download the "pray as you go" app. Daily prayer and reflection from Plough Publishing House, an independent publisher of books on faith, society, and the spiritual life. The Liturgical Season of Ordinary Time counts the time between Christmas Season and Lent, and between Easter Season and Advent. Ordinary Time readings, liturgy and prayer can be a rich time to reflect upon our relationship with God, our relationships with each other and to grow in depth on many levels. Creighton University Online Ministries has a huge variety of helpful resources for prayer in Ordinary Time. Examples are: "Praying in Times of Crisis", "Finding Our Way Back Home:Getting Un-Stuck in our Prayer Life", "Praying in Ordinary Time Before Lent", "Ordinary Time Symbols in our Home", "A Matter of the Heart: Prayer as Relationship" and many more.